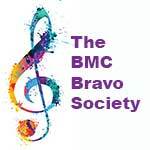 The upcoming year marks an important milestone for the Brattleboro Music Center’s Concert Choir, as Susan Dedell leads the BCC in her final year as music director. Culminating 29 years of visionary programming and compelling performances, she has chosen an exciting year of music, introducing the Choir and the community to the highly acclaimed Requiem of Karl Jenkins, with Junko Watanabe, soprano, and Elizabeth Brown on the Japanese shakuhachi. Karl Jenkins’ Requiem weaves five Japanese haiku memorials into the Requiem Mass in a transporting work that creatively reaches across cultures. Combining warm Western harmonies and melodies with the purity of Japanese songs, the Requiem is “the ultimate in postmodern Requiems.” (Music Week). Strings, horns, flutes (including the Japanese shakuhachi), and a plethora of percussion create a deeply moving and exalted celebration of the cycle of life. 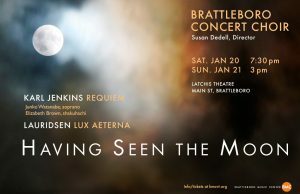 Also on the program will be Morten Lauridsen’s Lux Aeterna. Lauridsen (b. 1943) is at present considered to be the brightest star in the American choral firmament and rightly so. He is able to create elegantly-finished works of art that radiate with the glow of what is truly right and inevitable. His unmistakable sound is an amazing balance between the contemporary and the timeless. The Lux Aeterna is simply one of the most beautiful pieces of music ever written, gracious and exciting for both chorus and orchestra. Two performances are offered — Saturday, Jan. 20 at 7:30 pm and Sunday, Jan. 21 at 3pm.